With this perfect kit you will easily make your own Jagua tattoo at home! The kit includes everything you need to make it happen easy and fast. We have put our minds to form this kit so anyone can do it themselves with no special equipment. We have many other special designs you can choose from. All of our kits comes with our No.1 fresh jagua ink gel, the best original, natural top of the line with Food Grade ingredients that sold for many years now. Enjoy your new tattoo and please send a picture of it to our Facebook page. Don't forget to follow the instructions! After making thousands(!!) of temporary tattoos we can guarantee the process and if you'll follow it you'll surely succeed and enjoy it. With our temporary tattoo kit you will create the most realistic fake tattoo you have ever seen! 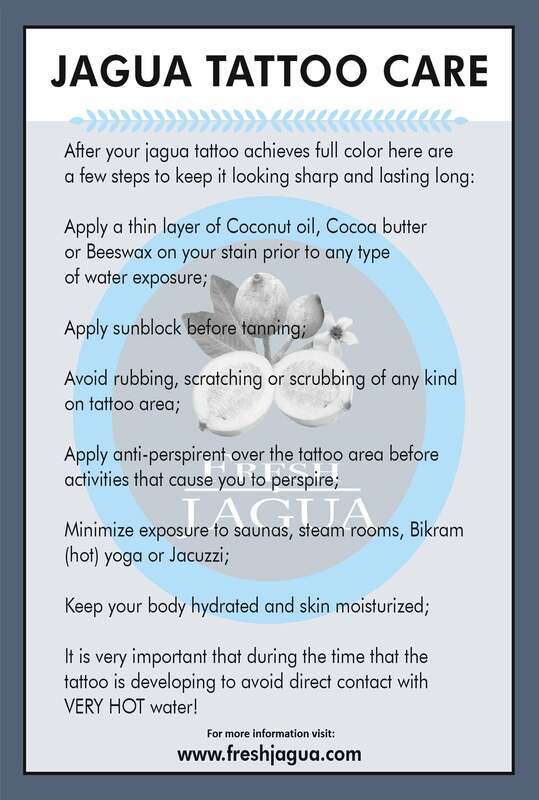 It’s a great way to try out on your own skin any tattoo design before committing to the real thing :) JAGUA LOOKS EXACTLY LIKE A REAL TATTOO!! !